Planning schemes set out policies and provisions for the use and development of land. A planning scheme covers each local council area in Victoria, and some special planning areas. The following online services provide access to Victorian planning scheme information. VicPlan - Zones & Overlays is a state-wide map viewer for location-based planning scheme information. 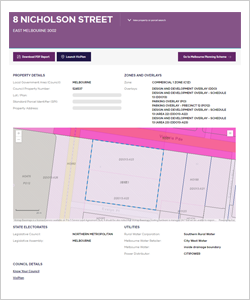 Generate a property or parcel planning report with localised maps showing each relevant zone and overlay. Current and recently approved amendments to planning schemes are available on the Planning website. The Victoria Planning Provisions are the standard provisions that form the framework for all of Victoria's planning schemes. Search a comprehensive index of all planning schemes since 1997 or view older planning scheme records at the Public Record Office Victoria. Download a PDF Planning Property Report, which includes more detailed planning information about your search result, by selecting the ‘Download PDF Report’ button. whether the property is in a designated bushfire prone area. A mobile application for iOS and Android which provides easy access to planning scheme information for any property in Victoria. The app provides the same reports available through the Planning Property Report service with the advantage of mobile access. view historical maps for the 1954, 1959 and 1968 Melbourne planning schemes. Access planning scheme maps and provisionsfor all of Victoria's planning schemes. Schemes are updated weekly to include amendments that have been approved and published in the Government Gazette. A free service is available on request for the preparation of Zoning Definition Plans. These plans show the location of planning zones or overlays relative to property boundaries. They can be used to identify the specific location of zones and overlay boundaries where they do not coincide with property boundaries. A planning certificate is an official statement of the planning controls that apply to a property. They are mainly used to satisfy the Sale of Land Act 1962, which requires a vendor to provide details of the land zoning, and any overlay controls or exhibited proposed amendments to the planning scheme. Planning certificates do not show the locations of zone or overlay boundaries, or details of any other specific controls. It is best to contact a planner at the local council to check for any other planning provisions that might apply. The Department issues planning certificates for the municipalities listed below. If your municipality is not listed here, you will need to contact your local council to get a planning certificate. If your municipality is listed above, you can apply for a planning certificate online by opening LANDATA® Titles, Property Certificates and Crown Land Status Reports and filling out a number of simple screens. your contact details, or your login ID (if you are a registered user). information about the property or properties in question. your credit card details for the purchase of the certificate or certificates. Prepaid accounts are also available.